Lush green fields of Dharur mandal, which were once barren before the launch of Nettempadu. Jogulamba Gadwal: Mallappa (68), a resident of Marlavedu village in Dharur mandal, was busy harvesting his groundnut crop in nearby Kothulagidde village by farm labourers on Friday. Though his grandmother owned 70 acres long ago, their family had to part with large parts of it due to water scarcity. He, along with his brothers, had to be content with 5.5 acres each, where he now grows paddy, groundnut and red chilly crops, thanks to the completion of Nettempadu Lift Irrigation Scheme three years ago, which filled the nearby Relampadu reservoir to the brim, bringing water to Dharur, Maldakal, Ieeja and parts of Ghattu and KT Doddi mandals. Three years ago, his land used to be barren, and now, the entire area looks lush green, with farmers busy with what they do the best. 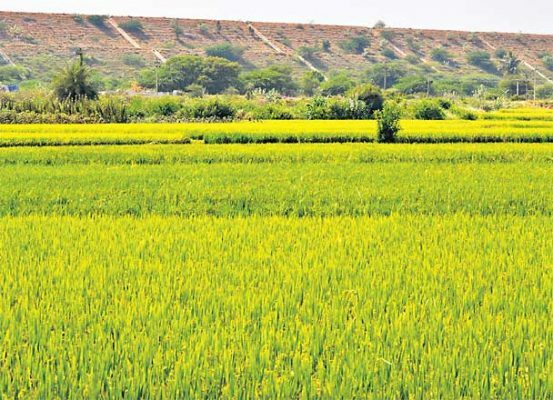 Though giving water to two crops is yet to be realised, farmers in Dharur mandal have been getting assured water in kharif for the past three years. When asked about the change he could see after the formation of Telangana and what his political inclination in the coming elections was, he said what the Congress couldn’t achieve in the past 70 years, was realised by K Chandrashekar Rao during his term as Chief Minister. “We need to keep a person in our palm and remember him forever who feeds us,” he said, referring to the service done by the Chief Minister to farmers. “We are now getting the 24-hour uninterrupted power supply, Nettempadu water, pensions and Rs 8,000 per acre per year. Is this not good enough for farmers?” he asked. Mallappa, who belongs to Reddy community, is now farming along with Venkataiah, a Dalit farmer from Kothulagidde, with a 50-50 partnership, which is a revolutionary change, especially in Gadwal district, which has been known for its feudal culture for ages. Jogulamba Gadwal: There is a welcome trend of reverse migration of farm labourers and farmers being observed in Ghattu mandal. On Friday, eight farm labourers from Aluru village of Ghattu mandal, which is about 10 km away from Dharur mandal, were busy harvesting the groundnut crop of Mallappa, a farmer whose fields were located in Kothulagidde. Previously, as they couldn’t find work due to irrigation problem, they used to migrate to Hyderabad, Bangalore and Mumbai for work. After the commencement of Nettempadu project, they have been finding plenty of work here, which made them stop migrating to faraway places. While they used to get Rs 500 a day in cities, they now prefer working for Rs 300 a day in their native district itself. On Friday, they have come walking from their village to work in the field because there are still no roads and public transportation in these villages which are near the border between Telangana and Karnataka. When Karreppa, one of the labourers, was asked about what his political choice was, he immediately said his vote would go to the TRS. When asked why not the Congress as they had promised more than what the TRS did in its manifesto, he said what Congress says was just ‘promises in the air.’ “Congress has not uttered a single word during the Telangana movement. Why should we vote for them?” he asked angrily. When Telangana Today asked them how come reverse migration was happening in Ghattu mandal, where irrigation was yet to reach the people, another one from the group said after Chief Minister K Chandrashekhar Rao had laid the foundation stone for the construction of Ghattu Lift Irrigation Scheme, a sense of hope was prevailing among the people of the mandal, who were convinced that irrigation in their mandal was just a matter of a couple of years. This farm worker, who didn’t want to be named, said he himself owned 10 acres of land, which was lying barren, and was looking forward to the completion of the project. Jogulamba Gadwal: A sense of fear has gripped the people of Gadwal constituency once again, just like during every election. People are scared of talking to the media, taking out names and expressing their concerns due to the fear of being targeted by political parties. ‘Telangana Today’ tried to speak with as many people as possible in Dharur mandal on Friday, but mostly, women were scared of freely expressing themselves; recently, those who revealed their political inclination were taken away from their house and were seriously warned by some leaders. One of the issue still afresh among the farmers of Relampadu village in Dharur mandal is the land acquisition, which was done during the Congress regime during 2012-2013, when 1,800 acres of land was acquired for Relampadu reservoir under Nettempadu Lift Irrigation Scheme by compensating farmers with Rs 1.10 lakh per acre with borewell and Rs 80,000 for barren lands. Compensation for their housing structures is still in limbo. Even for Rs 1 lakh, the beneficiaries (victims) had to let go Rs 10,000 as a bribe to corrupt officials in the then government, people from Relampadu told ‘Telangana Today’. Women who were sitting outside their homes were initially scared of revealing information in this regard as someone who spoke to the media against a party was kidnapped from their village by some of its leaders. Even elsewhere such situations were very common. One of the issues in the constituency has been that all political equations change just one or two days before the election day. Leaders are bought, people are intimidated, cash is thrown everywhere, and everything is managed. Many people believe that the same situation may arise once again during the coming elections, making a mockery of democracy once again. People opine that just a few days before the elections, big leaders, irrespective of their political affiliation, need to be bound-over, and CRPF jawans need to be stationed in every village of the constituency to prevent leaders from being managed and people from being kidnapped and intimidated. However, at least a teen in Relampadu village is brave enough to reveal that this time around, Chandrashekhar Rao would become the Chief Minister once again. Dinakar (15) was quite vocal about his political inclination. When asked why the TRS, he started naming the government schemes such as Kalyana Lakshmi, Rythu Bandhu, KCR Kits and so on, as if he was reading out tables from mathematics. He said at least a kaccha road was laid in his village which used to be cut-off from other villages before and added that this was yet another reason why he liked the TRS. There are kaccha roads built in these remote villages, and just when BT roads were about to be laid, the election code kicked-in. In many remote villages of Dharur mandal, there are not even kaccha roads inside the villages. Jogulamba Gadwal: TRS candidate from Gadwal Assembly constituency Bandla Krishna Mohan Reddy officially kicked-off his campaign on Friday morning, after offering prayers at the Lord Venkateshwara temple in Pagunta village of Dharur mandal. He, along with hundreds of his supporters, carried out a rally and reached the temple, where the annual jatara had begun on Friday. He offered prayers to Lord Venkateshwara and spoke briefly with the media expressing confidence that the TRS would win the segment for the first time in the history of Gadwal. Though this was his first day of the campaign, his wife Bandla Jyothi and ZP Chairman Bandari Bhaskar have been actively campaigning for his victory for the past couple of months in the constituency.